This week, dear listeners, we talk about HOLIDAY MOVIES! 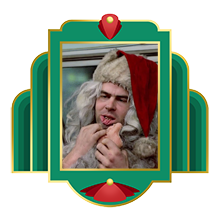 And before you run away screaming, we assure you that we will only be talking about holiday movies that don’t get enough love during the holidays. If all this holiday talk makes you want to drink along, we suggest Yellowtail Cabernet Sauvignon, which gets the job done nicely. “Tinker Tailor Soldier Spy” is a love letter to a kind of espionage movie they don’t really make anymore, and it’s astonishing in its detail. Also, one hell of a showcase for guys who can act the hell out of a moment that just involves a look, a quirk of the mouth, a tilt of the head. I’m so very glad I caught it in the theater, with a properly appreciative (read: “quiet”) audience. Part of the thing with the Python movies and their bits of historical accuracy is, Terry Jones is a huge history buff. If you want a good laugh with some education thrown in (or the other way ’round, perhaps) check out some of the documentary stuff he’s done over the last couple decades. “The Story Of 1,” “Crusades,” “Barbarians,” and so forth. And hey, shout out to Noel. He’s the one who pointed me in your direction, so huzzah!